**The Advisor has contractually agreed to reduce its fees and/or pay Fund expenses until at least July 31, 2017. Investors pay the net expense ratio. Overall U.S. stocks experienced solid gains for the third quarter of 2016, with the S&P 500 posting a gain of 3.85%. Most major U.S. stock indexes are now up year-to-date despite concerns over the pace of global growth, interest rates, volatile commodity prices, and a number of political uncertainties. We believe higher stock prices in the recent quarter reflected improving underlying economic conditions and relatively stable corporate earnings for most U.S. companies. While financial markets may remain somewhat volatile for the foreseeable future, we have not changed our stripes and remain constructive on the current opportunities for picking individual stocks. As fundamentals prevail, we see value and growth opportunities in many of the cyclical areas of the market such as financials, technology, energy, industrials and certain pockets of consumer discretionary, which have been held back by recent economic uncertainty. By contrast, we see less long-term opportunities in utilities and telecom, which have benefited the most from low interest rates and a recent flight to safety. Although this is no time to blatantly ignore macro conditions, we are also not attempting to forecast or market time interest rates, currency fluctuations, or commodity prices. Instead, we believe this is an ideal time to scrutinize the fundamentals of individual companies. Although not true for every company, we see many of the headwinds for earnings over the past twelve months subsiding as input costs stabilize and consumption remains in relatively good shape. As always, we are making a conscious effort to remain objective and open-minded in our buy and sell decisions, while continuously looking for new opportunities around every corner. Furthermore, we believe that there are many high quality companies running great businesses with excellent management teams that are still trading at bargain prices. Within the current investing landscape, we find U.S. equity valuations attractive with the S&P 500 trading at 16.6X forward earnings estimates according to FactSet. The inverse of this multiple is an earnings yield around 6.02%, compared to the 10-year treasury yield of 1.60% at the end of the recent quarter. We believe this risk premium indicates that the potential reward for holding stocks outweighs the underlying downside risk. The research team at Hodges Capital Management has continued to rigorously gather and analyze firsthand information from a broad scope of publicly traded companies. Here are a few worthwhile observations. First, most domestic corporations are still generating respectable levels of profitability and experiencing modest growth despite some earnings drag from currency translation. Second, many corporate balance sheets are generally in good shape, allowing many corporations to continue to reinvest in capital projects, make strategic acquisitions, as well as buy back shares and pay dividends. It is also worth noting that we have seen a reduction in the number of companies going public this year, which according to University of Chicago’s CRSP data is the lowest since 1984. This data also suggests that 31% of small cap stocks have reduced their shares outstanding over the past year, and that large cap companies have lowered their shares outstanding since 2011. Furthermore, domestic equity funds have continued to experience negative outflows year-to-date of roughly $75 billion, while domestic bond funds have seen inflows of more than $105 billion according to EPFR/Morgan Stanley Research. While we invest in individual companies, not stock markets, we can’t help to point out that market tops are not generally characterized by periods of fewer public offerings, reductions in the number of shares outstanding, and prolonged outflows from equity funds. Instead, stock markets are more likely to rise under such circumstances. While not every facet of the U.S. economy appears rosy, and global economic growth appears uneven, we maintain that current conditions provide no shortage of individual stocks with good potential relative to their underlying risk. Looking ahead, we would not be surprised to see volatility persist in the final quarter of 2016. In the midst of such volatility we have historically found bargains as we rigorously search for investments in well-run businesses that control their own destiny by relying on ingenuity and well-calculated business decisions. Although the macro conditions impacting the market can seem overwhelming at times, we always fall back on the idea that the long-term performance of stock prices is determined by the future earnings and cash flows of each underlying business. Stock prices over the long run are not a function of news headlines or short-term economic conditions. Ultimately, we believe earnings power and prevailing interest rates are more important to future stock prices than political noise or monthly economic survey statistics. In conclusion, we see this as an ideal environment for active portfolio managers to carefully select individual stocks that can generate long-term value for shareholders. During the third quarter of 2016, the Hodges Small Cap Fund experienced a return of 5.41% versus 9.05% for the Russell 2000 Index. Lagging relative performance in the most recent quarter reflected weakness across many of the Fund’s cyclical, consumer, and material related stocks. Disappointing relative performance also reflects the Fund’s lack of exposure to utilities and technology, which have year to date been among the leading sectors within the Russell 2000. The Hodges Small Cap Fund remains well diversified across industrials, transportation, financial services, and consumerrelated names, which we expect could contribute to the Fund's long-term performance. The Fund has recently taken profits in several stocks that appeared fairly valued relative to their underlying fundamentals, and established several new positions in stocks that we view as having an attractive risk/reward profile. The total number of stocks held in the Fund at the end of the recent quarter was 66 compared to 82 at the beginning of this year. Top ten holdings at the end of the quarter represented 26.0% of the Fund's holdings and included Texas Pacific Land Trust (TPL), JC Penney Inc. (JCP), LegacyTexas Financial Group (LTXB), Casey's General Stores Inc. (CASY), Fortinet (FTNT), United States Steel (X), RSP Permian (RSPP), Eagle Materials Inc. (EXP), Kapstone Paper & Packaging (KS), and Brunswick Corp. (BC). While the nature of small cap investing can provide opportunities for active portfolio management in just about any type of market, we view the current environment as an advantageous period for active stock picking within the small cap segment of the market. Small caps (as measured by the Russell 2000) have outperformed the broader market (as measured by the S&P 500) in the nine months of 2016, experiencing gains of 11.46% and 7.84% respectively. Moreover, we expect small cap investing to require a greater degree of individual stock selection and are now focusing on a number of areas within the small cap universe that in many cases are underfollowed or ignored by larger institutional investors. In the current environment, we expect merger activity to pick up as larger companies seek to grow by acquiring smaller businesses that can complement or expand their addressable markets. For the most part, we expect this type of consolidation activity to increase over the next couple of quarters, which could help support and even expand multiples for small cap stocks that could become the acquisition targets of larger companies. The Hodges Fund's third quarter 2016 return was 14.11% compared to a gain of 3.85% for the S&P 500 Index. Positive relative performance in the recent quarter was attributed to individual stock selection. Despite the headwinds surrounding many economically sensitive areas of the market, several of the Fund’s energy, technology, and material stocks experienced significant moves higher during the quarter, which included a 46% move in the Fund’s largest holding, Texas Pacific Land Trust (TPL) and a 45% increase in the shares of Micron Technology (MU). The Hodges Fund remains focused on investments where we have the highest conviction. The number of positions held in the Fund at the end of the recent quarter was 55. During the third calendar quarter of 2016, we took profits in a few stocks that appeared to offer less additional upside potential relative to their downside risk, increased the size of several positions in which we remain convicted, and entered into several new positions. For example, the Hodges Fund harvested a portion of our profits in AH Belo Corp. (AHC) and Duluth Holdings Inc. (DLTH), while entering into new positions such as the shoe maker, Adidas AG ADR (ADDYY). The top ten holdings at the end of the quarter included Texas Pacific Land Trust (TPL), Matador Resources (MTDR), J.C. Penney (JCP), United States Steel (X), American Airlines (AAL), GEO Group (GEO), U.S. Concrete (USCR), EnLink Midstream (ENLC), Delta Airlines (DAL), and Adidas AG ADR (ADDYY), which represented 39.2% of the Fund's holdings. 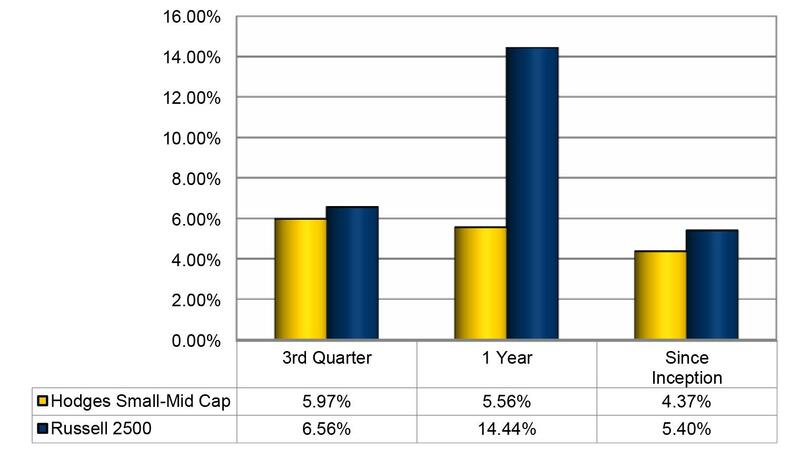 The Hodges Blue Chip Equity Income Fund experienced a loss of 0.02% in the third quarter of 2016 compared to a gain of 4.03% for the Russell 1000. Lagging performance relative to the S&P 500 in the recent quarter reflected weakness among several of the Fund’s high quality growth stocks, such as Tractor Supply Company (TSCO). Although we were disappointed with the Fund’s relative performance in the recent quarter, we are finding plenty of attractive high quality dividend-paying stocks that may offer upside in addition to dividend income as stable corporate profits support the ability of companies to pay out dividends. In many cases, we have found that long-term corporate bond yields are now less than the dividend yields on the underlying common stock of investment grade issuers. The Blue Chip Equity Income portfolio remains well diversified in companies that we believe can generate above average income and total returns on a risk adjusted basis. Top ten holdings at the end of the quarter represented 41.7% of the Fund's holdings and included The Home Depot, Inc. (HD), Facebook (FB), Microsoft Corporation (MSFT), General Electric Company (GE), Boeing Company (BA), Apple (AAPL), Johnson & Johnson (JNJ), Whirlpool (WHR), Continental Resources (CLR), and Procter & Gamble (PG). The Pure Contrarian Fund stands out as our best performing fund in the third quarter of 2016. The Fund experienced a gain of 20.28% in the recent quarter, which handily beat the 3.85% gain for the S&P 500 Index over the same period. Year-to-date, the Fund is up 56.19% compared to a return of 7.84% for the S&P 500 Index. Improved performance over the past couple of quarters has been largely attributed to significant improvement among several out-of-favor names, many of which are highly sensitive to commodity prices. The two largest contributors to the fund in the recent quarter were Comstock Resources (CRK) and Dixie Group (DXYN), which experienced gains of 81.8% and 40.4%, respectively. Although timing a recovery in contrarian stocks can be tricky over short periods of time, we believe this strategy could be very rewarding over a long investment horizon. We also expect this strategy to be less correlated with the broader market due to the general nature of contrarian investing. During the recent quarter, we continued to position the Fund in out-offavor investment opportunities that we believe offer the best upside relative to their downside potential. Top ten holdings included Comstock Resources (CRK), Nimble Storage (NMBL), Dixie Group (DXYN), Wells Fargo (WFC), Corrections Corp. Of America (CXW), United States Steel (X), ClubCorp Holdings (MYCC), GoPro (GPRO), Southwestern Energy (SWN), and Transocean (RIG). The top 10 stocks in the Fund at the end of the quarter represented 34.5% of the Fund's holdings. 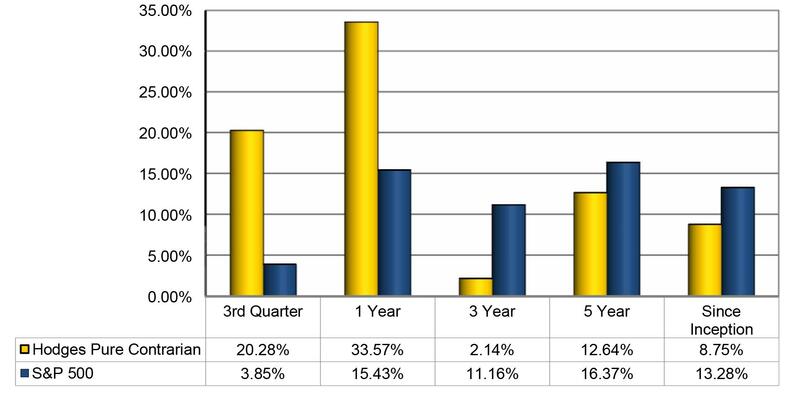 For the third quarter of 2016, the Hodges Small-Mid Cap Fund experienced a return of 5.97% compared to a gain of 6.56% for the Russell 2500. The Fund’s lackluster relative performance in the recent quarter was attributed to weakness in a handful of consumer stocks, such as Tractor Supply Company (TSCO) and Cracker Barrel Old Country Stores (CBRL). Top ten holdings at the end of the quarter represented 42.3% of the Fund's holdings and included ClubCorp Holdings Inc. (MYCC), WPX Energy (WPX), O’Reilly Automotive Inc. (ORLY), Callon Petroleum (CPE), Whirlpool Corp. (WHR), Cullen/Frost Bankers (CFR), Tractor Supply Company (TSCO), Parsley Energy (PE), Foot Locker (FL), and Casey’s General Stores (CASY). 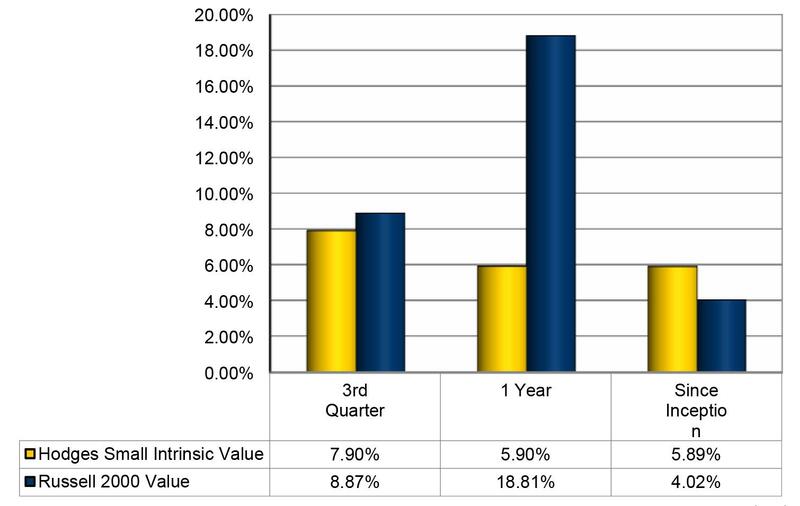 The Hodges Small Intrinsic Value Fund experienced a gain of 7.90% in the September quarter of 2016 compared to a gain of 8.87% for its benchmark, the Russell 2000 Value Index. The Fund’s lagging relative performance in the recent quarter was attributed to the Fund’s lack of exposure to the information technology and healthcare, which were the strongest contributors to the Russell 2000 Value Index. The Fund’s overweight exposure to a couple of out of favor industrial names also contributed to disappointing relative performance during the second quarter. The top ten holdings at the end of the quarter represented 27.8% of the Fund's holdings and included J.C. Penney (JCP), Dycom Industries (DY), Cypress Semiconductor (CY), MarineMax Inc. (HZO), Hilltop Holdings Inc. (HTH), U.S. Concrete (USCR), Sportsman’s Warehouse (SWHC), Triumph Bancorp (TBK), LegacyTexas Financial Group (LTXB), and Primoris Services (PRIM). Correlation: In the finance and investment industries, correlation is a statistic that measures the degree to which two securities move in relation to each other.